The Gunkan-maki sushi is a lot easier to make than classic or I/O sushi. The following flash illustrated guide will show you just how easier. Servings: 8 units. Preparation time: 10 min. Take a regular nori sheet and cut a long strip of it. Cut it about 4 cm high long strip. Make a ball of rice, about the size of ping-pong ball, and place it in the center of the nori. It should be in one line with the lower margins of the nori strip, since it is about to make a base for the gunkan maki. Cover it up. Gently but tightly, close the nori on the rice ball from all around it, squeezing it a bit to make the nori glue well with the rice. 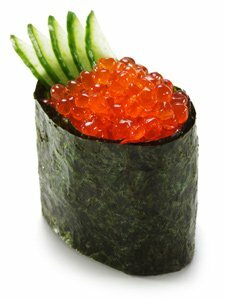 Take a tablespoonful of Tobiko (flying fish roe), ikura (salmon roe), kazunoko (herring roe) or masago (smelt roe). It is suggested to use fish roe in this dish, but sushi is all about creativity. Hope you like it. Check out our recipe for tobiko and quail yolk gunkan maki sushi. It’s delicious!